Birds Of A Feather star Lesley Joseph will be taking on the part of one of the most tyrannical characters in musical theatre next week. She plays the cruel orphanage boss Miss Hannigan in the musical Annie which can be seen at Milton Keynes Theatre from Monday May 30 to Saturday June 4. Determined to find her real parents, Annie’s luck changes when she is chosen to spend Christmas at the residence of famous billionaire Oliver Warbucks. But spiteful Miss Hannigan has other ideas and hatches a plan to spoil Annie’s search. With unforgettable songs It’s the Hard Knock Life, Easy Street, I Don’t Need Anything But You and Tomorrow, this is a show for all the family, andthere will be nine performances across the week. Lesley Joseph is, of course , best known for playing Dorien Green in the sitcom Birds Of A Feather alongside Pauline Quirke and Linda Robson. But she regularly appears on stage too and has played the role of Miss Hannigan previously at the West End’s Victoria Palace and also on national tour. Lesley is joined by Alex Bourne as Oliver Warbucks, Holly Dale Spencer as Grace Farrell, Jonny Fines as Rooster and Djalenga Scott as Lily. The company also includes James Alan- Evans. Lewis Bradley, Nic Gibney, Sinead Kenny, Michael Lin, Alice Liveing, Megan Louch, Callum McArdle, Benjamin Mundy, Steven Oliver, Heather Scott-Martin, Anne Smith and Kate Somerset How. Performances are at 7.30pm each evening with additional 2.30pm matinees on the Wednesday, Thursday and Saturday. Tickets for the show cost from £12.50. 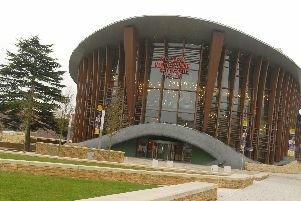 For more details or to book call 0844 871 7652 or visit www.atgtickets.co.uk/miltonkeynes.